Obama: Don’t Let Him Get Away With War Crimes! Since President Barack Obama’s inauguration, CODEPINK continues to model citizen justice by holding elected officials accountable for leading us into unjust and illegal military interventions and waging a drone war that has killed innocent civilians. We know that change will not occur unless citizens stand up (with a splash of pink) for peace, justice and accountability! Learn how we are holding the Obama administration's feet to the fire! In 2009, CODEPINK co-hosted Malalai Joya on a speaking tour throughout the US. Joya served as a Parliamentarian in the National Assembly of Afghanistan from 2005 until early 2007, after being dismissed for publicly denouncing the presence of warlords and war criminals in the Afghan Parliament. In 2011, CODEPINK introduced to members of the US Conference of Mayors an anti-war resolution, calling on Congress to redirect military spending to domestic priorities. The resolution successfully passed at the conference in June 2011. CODEPINK has included the use of drones in Afghanistan in all its drone work. This includes educational work, global outreach (especially Germany and UK involvement) and participation in protests at Creech and Hancock Air Force Bases. CODEPINK has engaged in educational work and lobbying in Congress to stop Obama's surge and bring troops home, and raised funds for the Afghan duvet project of Voices for Creative Nonviolence. Drones have become the signature weapons of the Obama administration's air strikes in Afghanistan, Pakistan Yemen and Somalia. Drones scout over the countries launching Hellfire missiles into the region missing their intended targets, resulting in the deaths of many innocent people including children. CODEPINK co-founder Medea Benjamin launched a new groundbreaking book "Drone Warfare: Killing by Remote Control." In the book, Benjamin writes about the menace posed by the proliferation of drones for killing abroad and spying here at home. The United States is the number one user of drones, but now over 50 countries have them, leading us into a world of chaos and lawlessness. Learn more about the book! CODEPINK brought together human rights advocates, robotics technology experts, lawyers, journalists and activists for two separate summits in Washington DC to inform the American public about the widespread and rapidly expanding deployment of both lethal and surveillance drones, including drone use in the United States. Participants had the opportunity to listen to the personal stories of Pakistani and Yemeni drone-strike victims and families. In 2012, CODEPINK traveled to Pakistan to protest US drone strikes that have killed more innocent people than militants. The 40-member delegation meet with the families of drone victims, lawyers, academics, Pakistani politicians and U.S, officials in order to promote peaceful relations between U.S. and Pakistan. In 2013, CODEPINK organized a delegation that traveled to Yemen to meet with victims of US drone strikes and family members of Yemeni Guantanamo prisoners cleared for release. Yemen is the country with the most Guantanamo prisoners (86 of the 166 prisoners) and the most US drone strikes. Delegates called for relations between the US and Yemen to be based on diplomacy and adherence to international law, not drone strikes and indefinite detention. On January 22, 2009, President Barack Obama signed an executive order to shutdown the US prison facility at Guantanamo Bay, Cuba. The prison has entered its 13th year of operation on January 11, 2015. As of December 2014, 132 detainees remain at Guantanamo. As of December 2008, around 50-60 detainees have been cleared for release, but have not been released. CODEPINK continues to advocate for its closure and release of prisoners by attending Congressional hearings, holding yearly vigils and bird-dogging elected officials. In May 2011, CODEPINK co-founder Medea Benjamin disrupted the President’s counterterrorism address, criticizing his drone and Gitmo policies. Take action to close Guantanamo! 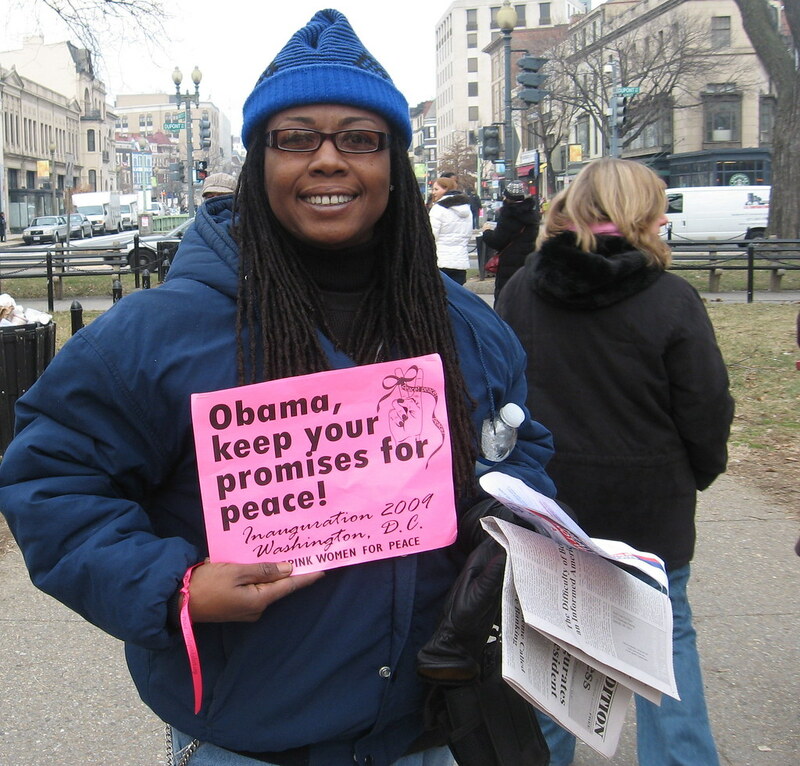 In 2014, CODEPINK called on Obama to Return his Nobel Peace Prize. CODEPINK activists gathered at the White House to protest military intervention in Syria and Iraq against ISIS and called on Obama to return his Nobel Peace Prize. Activists mourned those affected by war and called for nonviolent solutions to the conflicts in Syria and Iraq. In 2013, CODEPINK successfully delivered a petition with over 3,000 signatures to the office of Ambassador Samantha Power’s, the US mission to the UN in New York. The petition urged Ambassador Power to push for a ceasefire for Syria during the Geneva II Convention. CODEPINK and a coalition of women's groups launched Women Lead to Peace, a global alliance of women and male allies calling for an immediate ceasefire in Syria, an embargo on arms sales, greater humanitarian aid for the refugees and displaced, and the full participation of women at the peace negotiations. The group mobilized a physical presence in Geneva and Montreux from January 20-22, 2014 for a Women Lead to Peace Summit. CODEPINK protested Congressional Syria hearing: See the press coverage. CODEPINK staunchly opposes the use of military force in Iraq and Syria which both results in civilian deaths and is environmentally damaging. Take action!